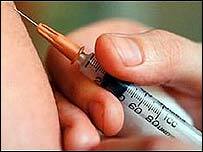 Scientists have developed a vaccine which may prevent people who have had cancer from relapsing. The vaccine has so far been tested on 19 people after they had surgery to remove cancerous tumours. Two years later, 14 were still cancer free. This compared to two out of seven patients who received a dummy vaccine. Writing in the Proceedings of the National Academy of Sciences, the doctors involved in the trial described the results as very exciting. The doctors are now planning to carry out a large scale trial to test the vaccine further. The trial, which will start next year, will involve patients in the UK, Australia and New Zealand. This initial trial involved a total of 46 patients, most of whom had melanoma. Nineteen were given the vaccine, which is called NY-ESO-1/ISCOMATRIXTM, at three-monthly intervals. The vaccine combines a cancer antigen, called NY-ESO-1, with a drug designed to stimulate the immune system, called ISCOMATRIXTM. Cancer antigens are molecules produced by cancer cells, which can be recognised by the body's immune system. According to the doctors, 14 of the 19 patients were cancer-free two years after their treatment started. This compared with seven out of 16 patients who only received the NY-ESO-1 cancer antigen and two out of seven of those who only received a dummy vaccine. Tests on the patients who received the combined vaccine showed that they were producing more antibodies compared to the other patients. They were also producing more T cells, which target the cancer antigen. "These results are very exciting," said Dr Jonathan Cebon of the Ludwig Institute Oncology Unit in Melbourne, who was involved in the trial. "They show that it is possible to stimulate an integrated immune response that has the potential to attack cancer from a number of different angles. "Being able to get antibodies, together with both types of T cells, gives us enormous confidence that we are heading in the right direction to develop a clinically effective therapy." Dr Ian Davis, who led the trial, said the finding should be interpreted cautiously. "In interpreting these data, we need to be mindful that there may be unforeseen variables that we didn't control for when we set up the trial," he said. "And of course this is a small number of patients." Professor Lawrence Young, head of the Cancer Research UK Institute at Birmingham University, welcomed the study. "This novel vaccine seems to be inducing a response in the majority of patients," he told BBC News Online. "We are seeing some signs of clinical responsiveness. It is very encouraging."